All of a sudden, musicals are behaving like buses. After a lean 2017 – La La Land, Beauty And The Beast and little else – two turn up at once. Pitch Perfect 3 is currently trying to hit the high notes and Boxing Day sees the arrival of The Greatest Showman, with Hugh Jackman in the title role. In the UK, we have to wait until next year for Coco and A Star Is Born (for the umpteenth time). But does the lack of musicals on the big screen mean we’ve lost our taste for them? And will Jackman and co change that? When Hugh Jackman tells you you’re going to experience the greatest show, you really want to believe him. And when he opens The Greatest Showman by demonstrating that he’s light and elegant on his feet, as well as having a decent singing voice, you want it even more. But what soon becomes apparent is that this is his film, not just because it’s a well-publicised personal project, but because he’s the best thing in it. By far. And, without him, this musical version of the life of impresario P T Barnum would be on very shaky ground. This isn’t the first time a musical has been based on his life. In the 80s, Barnum was a huge hit on both Broadway and London’s West End, but this is brand new. New songs, new script and all aimed fair and square the family market for this Christmas. But, despite a contemporary musical style, it reverts to a more conventional format: instead of the continual singing of the likes of Les Mis or Sweeney Todd, dialogue is punctuated with songs in the good, old fashioned way. Songs that draw on R&B and hip hop, as does much of the dancing, making for some strong set pieces, full of colour and fizzing with energy. And, even though some of the chorus numbers have a certain sameness about them, they’re equally hard to get out of your head after the film is over. But underneath all the glitz, glamour and music lurks the sense of a harder hitting, more adult musical wanting to get out, one that would have been less soft focussed in its portrayal of Barnum. Instead of P T Barnum, he’s more like P C Barnum, an advocate of diversity and equal rights, employing social outcasts, pushed to the fringes of society because their appearance: a bearded lady with a beautiful voice, people of colour, a dwarf, a really tall man and a massively obese one. Or, for many New Yorkers, freaks who don’t deserve the spotlight. It’s a theme that will chime with audiences, but what it shies away from is that Barnum’s reason for employing them was that he was flat broke and needed a big attraction for his circus. That aside, there’s no doubting Jackman’s charisma in the title role, one that plays to his strengths, including being a romantic leading man: he’s married to the beautiful Charity (an under-used Michelle Williams) and has an apparently chaste relationship with Swedish singer Jenny Lind (Rebecca Ferguson, looking remarkably like one of Sweden’s most famous cinematic exports, Ingrid Bergman). 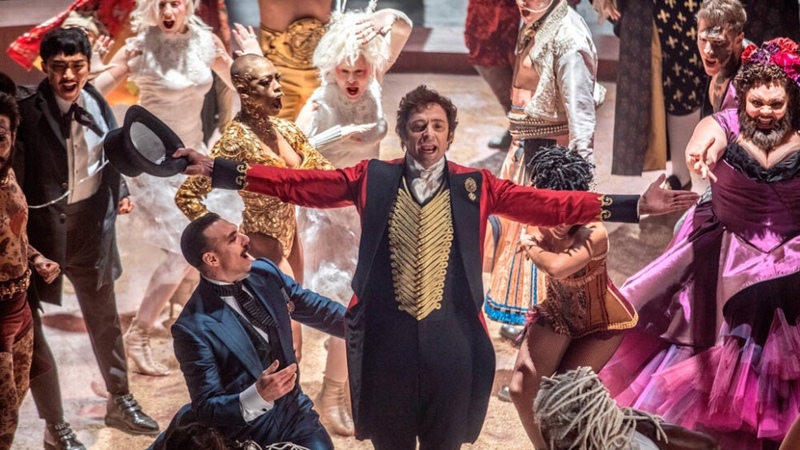 Alongside Barnum’s own story is a secondary romance, involving his business partner, the wealthy Philip Caryle (Zac Efron): he falls in love with trapeze artist Anne Wheeler (Zendaya), who is mixed race and, as far as his parents are concerned, unacceptable. Efron is lit to give him a dewy eyed appeal but, in truth, he’s nowhere near Jackman in the acting or dancing stakes. The Greatest Showman’s opening song says “it’s all that you want, it’s all that you need.” Not quite. Want you want and need is something with a bit more bite. As it is, it’s an easy on the eye musical with plenty of colour, energy and a magnetic turn from Jackman. It’s good, but not the greatest. Freda Cooper is a film critic and broadcaster. She tweets @FredaTalkingPix. "...Nobody calls me Lebowski. You got the wrong guy. I'm the Dude, man."